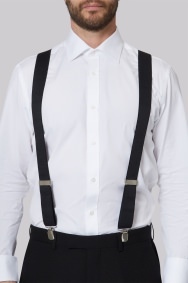 Bring practical poise to your big night out with these versatile braces from Moss 1851. 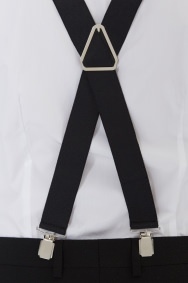 Quirky and just a tad preppy, they work to bring personality to traditionally formal looks. 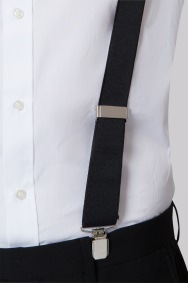 Pro tip: braces are the secret weapon that can help keep your silhouette sleek while pulling your outfit together. 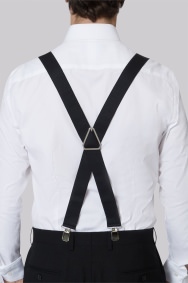 Providing support from the shoulders they keep trousers firmly in check while perfectly framing a crisp white shirt. Do what they’re intended to. Moss Bros is a great place to shop with friendly staff and this is about the ninth piece of clothing I've bought from Moss Bros.
DON'T KNOW STILL WAITING FOR ORDER TO ARRIVE AFTER NEARLY A MONTH. My first venture into the world of braces, they were a worthwhile investment. I love this braces. Look and feel are awesome. Not worth the money in my opinion. Perfect and very good value! Not a lot to say about braces other than they did the job. My husband was so pleased with these ... He felt the wider straps made them extra comfy to wear, just as the salesman suggested. Great value for money and good quality ???? Wasn't too sure if the colour would co-ordinate with the rest of my attire but in fact it did it splendedly therefore i was thrilled.